Strings of colourful flags criss-crossed the ceiling overtop of tables lined with an assortment of framed photos, food and skulls in a classroom in Bricker Academic Building on Thursday. This was the setting of a Day of the Dead event, hosted by Maria Eugenia de Luna Villalón’s SP 301 class to teach the Laurier and Waterloo community about the Mexican tradition. The event involved a group of students in de Luna Villalón’s class giving a presentation on the Day of the Dead in Spanish. At the front of the room with them were several ‘alters’ which they referred to intermittently. Rivas, a third-year politics and Spanish student, was one of the presenters. The Day of the Dead, he continued, is a two-day celebration that takes place on Nov. 1 and 2 and is meant to honour the dead. Families spend the day visiting and cleaning the tombs of their loved-ones. They also create altars which are decorated with flowers and items that the deceased individual enjoyed. Examples of such altars were set up at the event. The event was part of a project de Luna Villalón, an associate professor Spanish, assigned to her students that was aimed at coupling teaching with learning. At the beginning of the course, students were divided into groups and assigned different tasks relating to their unit on the Day of the Dead. De Luna Villalón explained that some students were asked to give a class presentation on research they had done on the Day of the Dead. Other students were tasked with creating a promotional video, a poster and giving a presentation on several prominent Spanish figures that they could devote altars to at the event. “I wanted them to work on something that they could bring to the rest of the community that was relevant inside our classroom and to share that knowledge with the rest of the community,” she explained. This was the first year it ran and she hopes that it will continue. She thought that the event went well, considering it was the first time doing it. While she felt the turnout was good, she explained that the majority of those in attendance were in her class or other Spanish classes. For Gregory Maza, a member of the Waterloo community who is originally from Venezuela, this was his first contact with the tradition. His first language being Spanish, Maza said he enjoyed seeing the effort the students put into doing the presentation in Spanish. 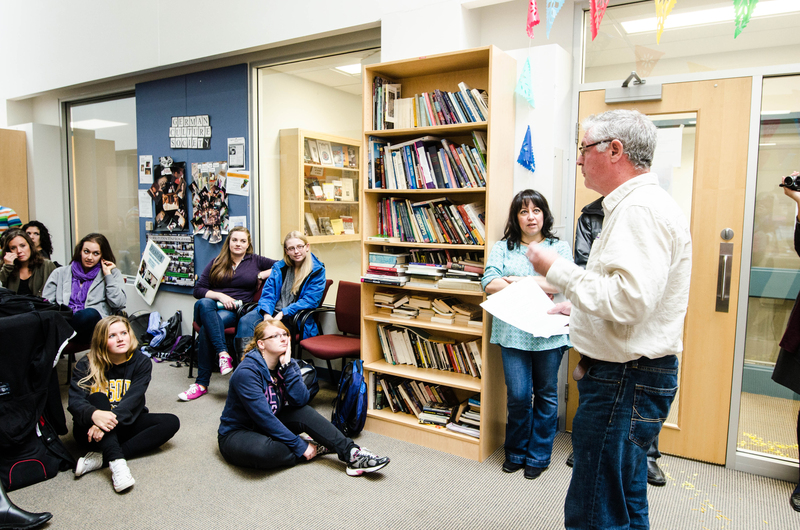 Hynes believes events such as this are important for the languages department.